A couple of weeks ago I spent fourteen fascinating hours watching Ken Burns’s newest documentary, “The Roosevelts: An Intimate History.” I have had a fondness for Franklin and Eleanor Roosevelt since I heard my grandmother talk about them when I was growing up. It is easy to forget after so many years how important FDR’s Great Depression recovery policies were to the country as a whole and particularly to the part of north Alabama and the Tennessee River Valley where I currently live. At the time the Tennessee Valley Authority was inaugurated as part of Roosevelt’s New Deal, the improvements in the infrastructure for north Alabama led to the development and progress of the decades to come. TVA’s Wilson Dam changed the Shoals area immeasurably. I am convinced that Huntsville’s considerable growth and the development of its substantial technology, space, and defense industries can be traced directly back to the technological advances spawned by the Roosevelt administration of the 1930s. I am also convinced that some of the local politicians who run campaigns railing against “big government” and “government interference” would not have been born if not for the government assistance and programs that came to the aid of so many millions during the Roosevelt New Deal era. Tennessee Valley Authority (TVA). Works Progress Administration (WPA). Civilian Conservation Corps (CCC). Federal Housing Authority (FHA). Social Security Administration (SSA). The alphabet soup of programs initiated by the FDR administration is large and impressive. Some of them still exist today. Most towns, wherever you travel in the country, still utilize the legacy of the New Deal in extant public spaces, buildings, tourist sites, roads and highways, dams and factories. The WPA art works, photographs, performing arts, and literature were created by many people — some of whom would move on to become among the brightest lights of twentieth century American arts. When Roosevelt took office in 1933, about 90% of urban Americans had electricity compared to roughly 10% of rural Americans. The Rural Electrification Administration (REA) was created to rectify that situation and by 1942 the number had risen to 50%. Ten years later, close to 100% of Americans in rural areas had electricity. My grandmother often talked about listening to Roosevelt’s “Fireside Chats” by her radio (after the REA had supplied electricity to her family’s rural Cullman County residence). My mother still has recollections of my Grandmother Harbison pulling her chair right up to the radio to listen to the coverage of FDR’s funeral in 1945. She sat listening all day. Fuelled by the documentary, I searched for a book compilation of the columns. 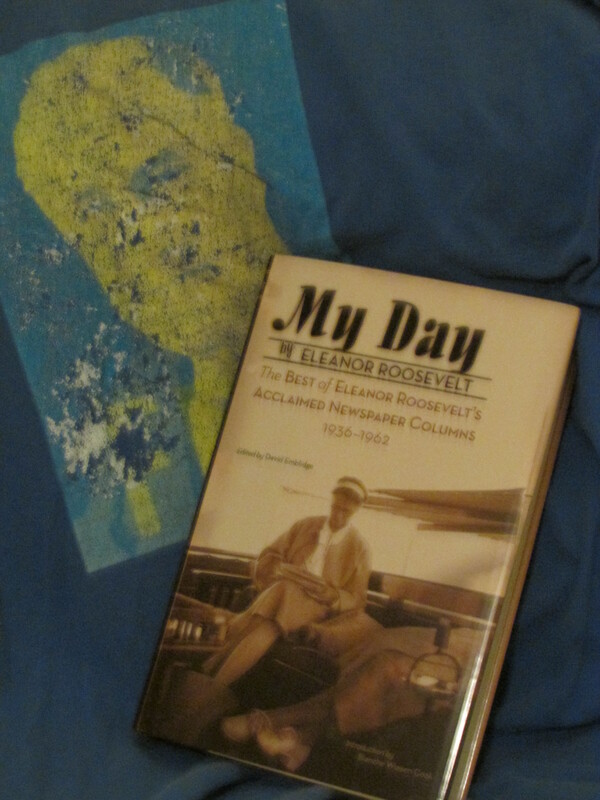 What I found was My Day by Eleanor Roosevelt: The Best of Eleanor Roosevelt’s Acclaimed Newspaper Columns 1936-1962, edited by David Emblidge (New York: MJF Books, 2001). I ordered it and will soon give it to my mother, but I am reading it first and having a grand time of it. Mrs. Roosevelt’s written communication skills are as clear, blunt, and articulate as her husband’s much-lauded oral communication skills and she tackles a staggering array of issues with taste, tact, and progressive common sense. There are also warm personal insights about holiday outings with the family, gardening, fashion(! ), and the amazing array of 20th century personalities she knew — from her uncle Theodore Roosevelt to John F. Kennedy, from Helen Keller to Autherine Lucy, Shirley Temple to Nikita Krushchev, Winston Churchill to Humphrey Bogart, … you get the idea. “My Day” and Ken Burns’s striking new documentary provide human and first-hand insights into some of the most important events of the twentieth century. We all need to remember and learn. This entry was posted in books, history, The Roosevelts and tagged Alabama, Eleanor Roosevelt, Franklin D. Roosevelt, Ken Burns, Twentieth Century history on October 2, 2014 by gedwardjourney.